BlackBerry's CEO (yep, it's all BB now, no RIM anymore) Thorsten Heins just took to the stage today to announce the BlackBerry Z10, its new powerhouse handset with the brand new BlackBerry 10 mobile OS. The Z10 is a fully touchscreen device, unlike the nostalgic Q10, and it sports modern specs, too, with cool patterned soft-touch material on the back. The screen is 4.2" LCD with 1280 x 768 pixels, making for a pixel density of 356ppi. A 1.5 GHz dual-core processor and 2 GB of RAM are the power under the hood, and there are 16 GB of internal storage, as well as the all-important microSD card slot. You will need all the RAM, because BB10 is a true multitasking system, like Android, so everything remains how you left it, or moves on under the hood, but is available at all times. Cameramen will have an 8 MP rear main camera with LED flash at their disposal. It captures 1080 video, of course, and there is a 2 MP front-facer with HD capture. There is NFC, and wired connectivity includes microUSB and microHDMI ports. The Z10 is just 9 mm thick, so it won't feel chubby in your hands - all in all, a pretty decent package, and available in white, too. It's the software that will count with BB fans, though, and a special attention has been given to the keyboard to make it as BlackBerry-esque as possible, and it indeed is a carbon copy of its physical counterparts. The added value is gesture typing with above-key choice of word suggestions and left swipe to delete word by word. There are at the moment over 70,000 applications for the phone, which is the most any mobile OS has had at launch, among which are Skype, WhatsApp, Angry Birds, SoundHound, Rdio, Where's My Water, Amazon Kindle and so on - over a thousand of the top applications have been committed to BB10 by now. All major US carriers have plans to offer the BlackBerry Z10, with availability with them expected to be sometime around March, though exact availability dates have not been announced. 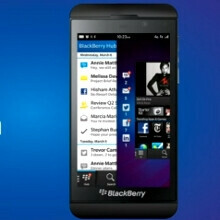 Canada will get the Z10 on February 5 for CAD 139.99 with the typical 3-year contract available north of the border. In the UK, it will be launched as soon as tomorrow with major carriers. The Z10 will be available there as fully subsidized or pay-as-you-go handsets, and in the US carriers will announce pricing at a later date. Oh, and the new Global Creative Director for BlackBerry now - Alicia Keys. The specs are quite the same as the rumours so far. Well done on the design, but that's an epic bezel around what looks like a small screen compared to the whole thing. It also has past season hardware. I absolutely concur with your sentiments. Who cares about a bezel. Pitty it has only medio core specs with a 4.2" screen and dualcore processor. This new Z10 won't be able to compete with the latest Android high-end devices with 5" screens and running the latest quad cores (soon eight cores) I think these specs wil only be enough to pull customers away from iPhone users who used to be BB users. i would say time will tell but i think the infrastructure of BB10 will get people like the BBM hub and etc. It's not all about specs droider. It's about how it all comes together for the end user experience. This is y the iPhone is such a phenomenal device. Then obviously it's not for u, but if you're trying to diss it...forget it. It's an excellent device, not without its short comings but an excellent device. If u tried it out n the store, that's not good enough. Spend some time hands on with it, get into it, and you'd see. And u double click the home button to bring up the multitasking tray. Works greats as well. Except fot the fact that BB10, MeeGo, Symbian are better at multi-tasking (real) than Android. Ahhh, MeeGo? Symbian? Are we going back to the stoneage? Regarding BB10 I can not say anything, because I have not had the opportunity to play with it yet. But as far as the BB10 YouTube movies show, I haven't seen any demo of the split-screen with two apps running nor a video running on top of an app though. Going back to the stone age comment makes no sense when the fact that both of these OSes have their fans and people USE the phones. Come and tell Android is best at multi-tasking when it doesn't lag or freeze while running 8 apps. "Video running top of an app", so tell me do you watch a video while playing angry birds or temple run or running whatever app you are on. Get real man. You're right about the fact people are using those OSes but there are also people still using monochrome displays on their phones and txt sms ;) For those iOS is the right choise as those people like to keep it safe (like in the past we used to use it). I think it's perfect for older people ;) Regarding the multi-tasking you've got to ask yourself on which device would you run 8 apps simultaniously. But non the less if you follow the link, you'll see that running 4 LIVE VIDEOS will run simultaneously on the Note 2 running Android. (starting at approx. 4:00") http://youtu.be/9nh2NSLgaII And I can confirm the Note 2 runs VERY smooth with Android. It's just no match for any other OS at this time. tech specs wise i have to agree high end android phones like the note 3, and gs4 which is most likely come out this year will be massive. i have to agree. if i use my device to do any kind of work on it for my job, a bigger screen is more attractive to me. maybe the OS will be what people are more interested in. maybe the true multitasking is the attraction. with iphone reportedly coming out with new phones, i dont think this will be enough to pull those iphones users back to BB. not saying i dont want BB to succeed, i just dont think this phone spec-wise is enough. Yeah, when a Droid with 8 core works smoother and faster than this BB10, give me a call. You make it sound as if an octa core will get you pu$$y. Do you actually make full use of a dual core? depends if the app is coded to make use of it. most apps arent. especially apps like instagram or facebook. they dont do enough to warrant needing to use both cores. but that still doesnt help the consumer. if you are going to pick up a phone, cand you have a BB10 with 4.2 inch screen and dual core processor for $99 (just a comparison) and right next to it is an android with 4.7 inch 1080p screen with quad core processor for $99, why wouldnt i buy the better spec phone for the same price? why is iphone going with bigger screens in the future then? thats right, people want bigger screens. using iphone as an example didnt help you. iphone has crappy battery life also. i'm not trying to defend android, i'm saying people DO want bigger screens and upgraded hardware, to say "people dont need it" or it's not needed means you are blind. android had 68.4% global market share. that's alot of people going for the android experience and liking it. your arguement is flawed. McDonalds sells the most cheeseburgers, does that mean they make the absolute best burgers? Android is doing so well because its on a wide variety of devices, probably the majority of android devices are lower-end phones that people can afford, I doubt the majority are the new bleeding-edge beasts. Being open-sourced and any manufacturer is able to use it, that gives it a huge advantage in terms of getting market share. Android isn't bad at all, but you can't use market share to say its best.